Orthopaedic referrals are carried out by Mark Straw BVetMed CertSAS MRCVS, RCVS Advanced Practitioner in Small Animal Surgery. Mark graduated from the RVC in 1996 where he developed his interest in orthopaedic surgery. Following a year in first opinion practice Mark moved to Beechwood Veterinary Hospital where he increased his surgical caseload gaining his CertSAS in 2001. Since this time Mark has offered referrals in the discipline of orthopaedics where he is presented with an increasing number of interesting and challenging cases on a daily basis. As not all clients wish to pursue a referral, Mark is always happy to discuss cases with veterinary surgeons whether or not they proceed to referral. In house permanent 16 slice Siemens CT unit. Radiographs assessed and report emailed on day of receipt. 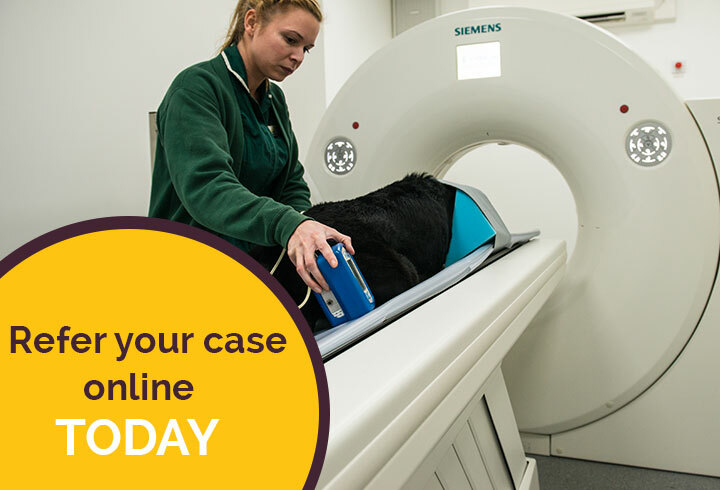 To refer a case please contact the Hospital on 01302 534999 or complete the online referral form. We will then contact the client directly to arrange a suitable appointment. In cases that require urgent treatment please contact Mark Straw directly such that a suitable appointment can be scheduled. The initial consultation will consist of a medical history review, a detailed examination of your pet and a review of any history and radiographs which have been provided by your home veterinary surgeon. In the majority of cases, further investigations will need to be performed. This may involve taking further radiographs, blood or tissue samples or recommending further, more advanced investigations such as MRI or CT scanning. We will usually admit your pet to the hospital on the day of your appointment such that investigations and in some cases, surgery can be performed early the following day. If surgery is required your pet will usually be hospitalised after surgery for further monitoring and for pain relief to be administered. Most cases are discharged from the hospital 24-hours after surgery however some cases, for example spinal cases or complex fractures, require longer periods of hospitalisation. Post-operative examinations will be performed by both Beechwood Veterinary Hospital and your own veterinary surgeon. A report will be faxed to your home practice prior to your pet being discharged from Beechwood Veterinary Hospital to ensure they are kept fully informed regarding the management of an individual case. Follow up reports are also given on a regular basis. You will receive an estimate of cost before investigations or treatment are commenced. Precise estimates are difficult to give due to the variable nature of the cases presented to us however we will endeavour to keep you fully informed of costs as the case progresses. Fees are charged for work as it is done. The initial estimate will not include follow-up appointments, further radiographs, additional surgery or additional medication. Fees should be settled at the time your pet is discharged from the hospital. If you have pet insurance, claim forms may be left with us for completion and for us to submit to your insurance company. Please understand that we cannot be responsible for any decisions made by your insurance company.